When a disaster occurs, it is not always caused by a “natural” disaster. 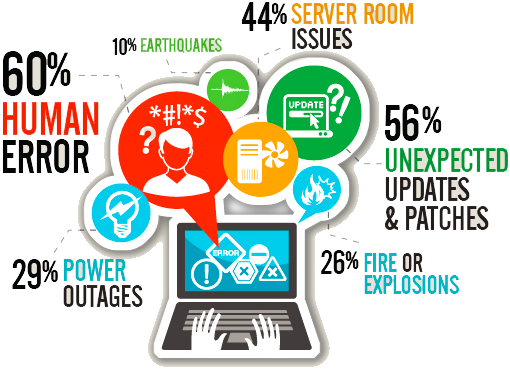 How important is a reliable backup and recovery system? You always hear that backing up your system is important, and we cannot stop stressing this point. We do not only backup your data, but also take an image of your system so that we can restore your network and effectively minimize your downtime. Depending on your Business Continuity requirements, we will even install a backup appliance at your business to get you functioning in minutes and not hours. Business Continuity and Disaster Recovery Planning addresses the preservation of the business in the face of major disruptions to normal business operations. We design and help you to implement this, not only from an IT perspective, but also from a company-wide plan. MethodIT has partnered with Datto to protect you and your business from disasters, natural or otherwise. Call us at 808.678.0502 for information on How.